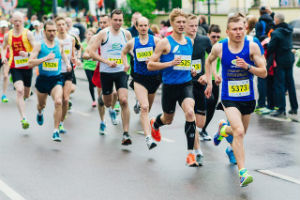 If you’re getting serious about running and starting to run longer distances, you’re probably noticing that your legs are pretty sore at the end of a long run. Some of that is easily explained by muscle soreness due to activity. The rest, however, is likely a combination of lactic acid build-up, and a lack of support. Luckily, there’s an easy solution to both problems: compression socks specifically made for running. In this review, we’ll talk about some of the best compression socks for women. I’ll tell you what to look for in a sock, provide a list of ten compression running socks to choose from (including five budget and five high-quality items), and give you some details about three of the best women’s running socks on our list. Have fun! These socks never cease to impress. They can be found for some of the lowest prices. Not only are they inexpensive, but they are stylish, offer great arch support, stimulate blood flow through gradual compression up the calf, and promise to reduce foot and leg swelling. Go2 women’s socks have a compression strength of 20-30 mmHg, which is pretty strong. This level of compression will provide support up the calf and especially to the ankle. It will also constrict your feet and lower leg muscles, lessening or preventing swelling. For this reason, socks like these can also be worn after a workout as a recovery aid. Technically, these are unisex socks, but they are advertised as women’s. If the Go2 socks are an unlikely bargain, the Danish Endurance socks are very upfront about their worth. These are some of the most expensive socks in this review. That’s because of their quality, like the reputation of Danish Endurance, is beyond reproach. One of the nice things about these socks is that they’re made in the European Union and are guaranteed by Danish Endurance to be 100% sweatshop-free. 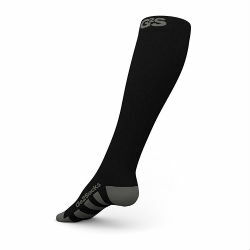 At 16-21 mmHg, these socks don’t quite have the compression ability of the Go2s, but they compensate by being made of very fine and durable material. Built for athletes, these socks even come with a padded heel meant to absorb the force of impact upon striking the ground. This extra padding doubles as a safeguard against blisters. Danish Endurance claims their socks are ideal for indoor or outdoor activities, air travel, and long periods of standing. They also claim their socks boost performance and speed up recoveries after workouts. Their socks are made of a blend of plyamide, elasthan and lycra. At the other end of the scale we find the Champion’s Women’s Running Socks. These socks are utterly without pretense to the point that they stand out quite a bit from the others on this list. Unlike most other models in this review, these socks by Champion offer little in the way of design. They are ankle-high, meaning they won’t show up above your shoes anyway. This also means that they provide no additional support to the ankles, shins or calves, unlike compression socks that extend higher up the leg. Nevertheless, these socks are designed to offer substantial support to the arches of the feet. Arguably one of the best features of these socks is their price. These socks are lower priced than some similar alternatives. Okay, so you’ve decided to give compression socks a try! That’s great, but now you need to think about what to look for. If you’re buying them for running, there are really three things you want to see in a compression sock: support, muscle recovery promotion, and an affordable cost. 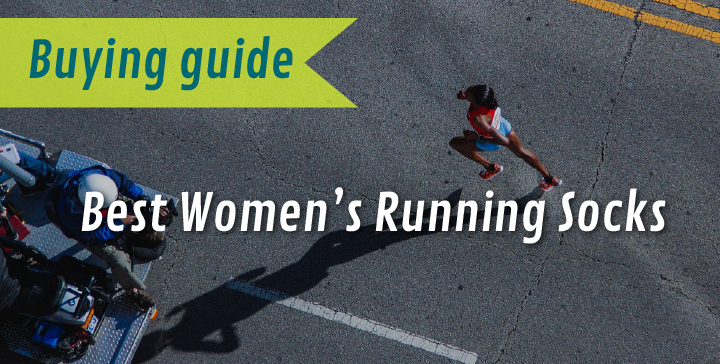 Running can be taxing on your feet, calves, knees, and more. If you exercise without taking care to support these muscles and ligaments, you increase your risk of injury and setting your training back weeks. Not only can compression socks prevent against this, they can even make new injuries less likely by keeping your muscles in line while you work out. Contrary to normal socks, which can be loose, the compression running socks will offer a level of rigidity that holds things where they should be. Knee-length compression socks will not only stabilize the arch of your foot, but also provide support to the ankle and keep your calf muscles from vibrating and tearing away from your tibia. Stopping muscles from vibrating increases running economy—the efficiency at which you run—by reducing needless and energy-wasting movements in your legs. Ceasing those muscle vibrations also relieves soreness in the calf. In this way, the right pair of compression socks will not only protect your existing injuries but will also help prevent new ones from cropping up. While compression socks have many uses during a workout, they can also be a great asset in the aftermath of a run. Studies have shown that applying compression to muscles causes them to heal better and with less pain. maintain that this is due to improved blood oxygen content brought on by compression gear. Whatever the case, it seems to be the real deal. Some companies even recommend sleeping in their clothes as a means of speeding up recoveries after especially onerous workouts. Check to see if the manufacturers of the socks you’re buying claim that their socks decrease recovery time. This is a valuable aspect of compression socks that shouldn’t be overlooked when deciding on a purchase. 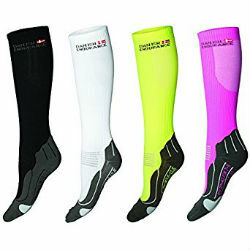 Like all sports gear, compression socks come in a pretty big range of prices. In this review, there are pairs that can be found for as little as nine dollars or as many as fifty. Before you decide on a pair of running socks, you should think about what you expect to get out of them and how much you really want to invest. The thing about compression socks is that at the end of the day, they’re still socks. If you’re a casual athlete, the quality of your workout or performance isn’t going to be pushed over the edge by a high-quality sock. You’d be better off opting for a medium to low priced compression sock than spending tons of money to wear what your favorite athlete is wearing. are plenty of good deals to be had out there. Just do a little research before you purchase. Also: you may want to start off with an inexpensive pair, just to be sure you want to make the financial commitment. 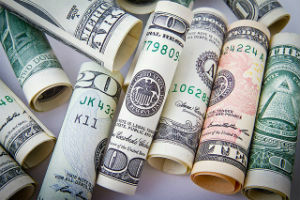 One final note about money: be sure to do some comparative shopping. Sometimes buying directly from the retailer isn’t the way to go—sometimes it is. Just dig around. Helpfully, most brands will have sizing guides online, so you can peruse the Internet for the best deals available. Ok, so you’ve heard my take on things and now it’s time to choose a running sock. Personally, I think the Champion socks are a great way to start off for a more casual runner. They’re inexpensive, come in sets of three, and still provide a solid amount of support to your feet during your run. They probably aren’t much different than the socks you’re wearing right now, so they’ll be an easy transition. If you’re not satisfied with that idea, I’d have to recommend trying the Go2 Women’s Compression socks. 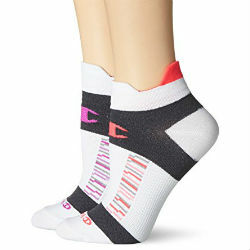 They are some of the top compression running socks for females and they provide the most compression (20-30 mmHg). These socks can be found for a reasonable price if you shop around. Other than that, they are almost knee-high socks, so you’ll be able to more fully appreciate the benefit of these athletic socks.